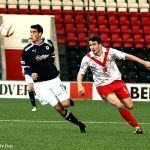 The Rovers travelled home from Airdrie watching multi-coloured flashes light the sky reflecting on a match which saw more fireworks than they’d hoped for… There were changes to the Raith side with Laidlaw and Donaldson coming in for McGurn and Malone. The home side lined up with ex-Rover John Boyle up front. 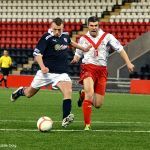 The Rovers started brightly and in the 5th minute Brian Graham played in Allan Walker and Evans brought the Rovers captain down. 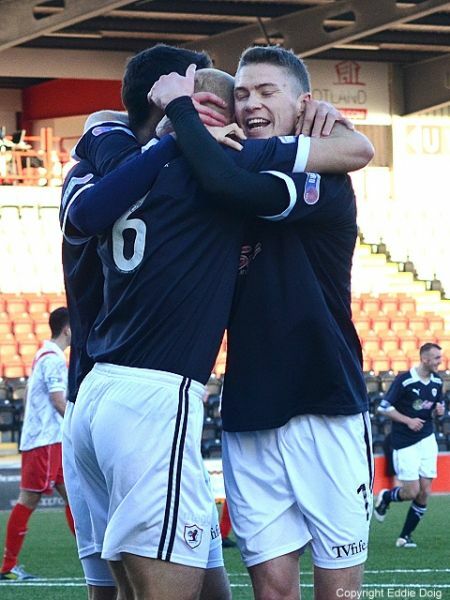 The big number six was booked and Dougie Hill headed the resultant free kick at Kenny Arthur in the home goal. Stallard joined his teammate in the book in only the 8th minute having caught Mensing late. The Rovers won a couple of corners and Hill got on the end of the second fizzing a header across goal and past the post with Arthur struggling. 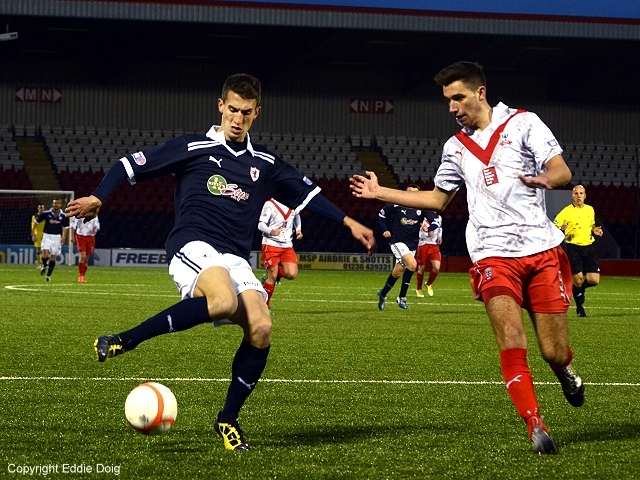 The deadlock was broken in the 12th minute. 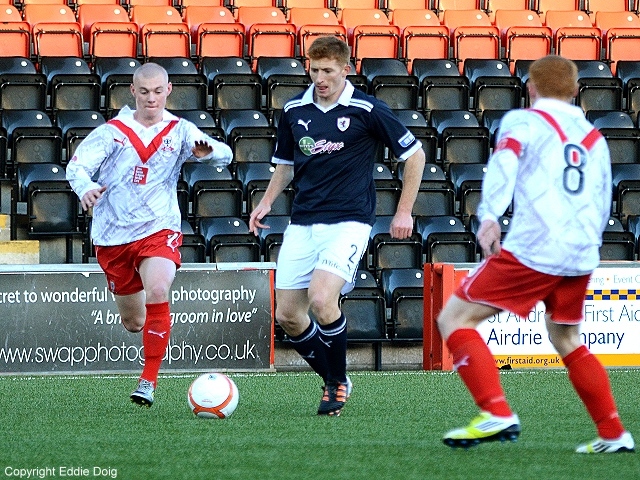 A rare Diamonds attack was broken up by Thomson and Walker on the right. Thomson received Walkers pass and set off forward on the break. Jason passed to Spence who’s cross found Graham in the box. 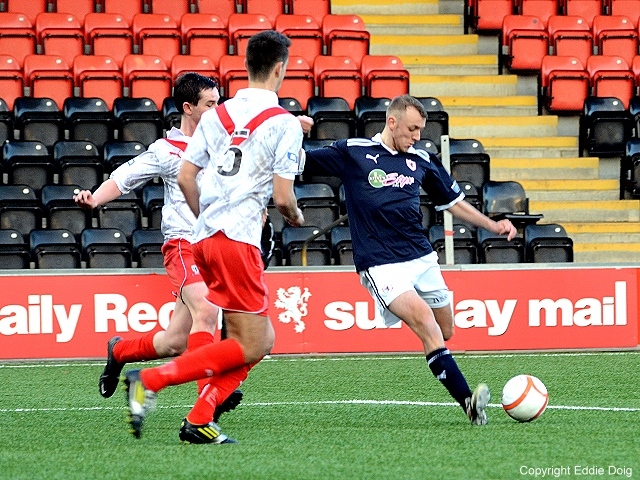 He headed the ball back across the box into the path of the inrushing Simon Mensing who volleyed home from 8 yards. It was a good flowing move ending in a cracking goal. Pat Clarke was booked it appeared for not retreating rapidly enough at a free kick. Kenny Arthur was relieved to see Spence’s glancing header flash wide. It took until the 22nd minute for the home side to threaten when a free kick was back headed past Laidlaw’s goal harmlessly. 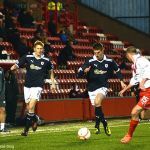 The Rovers were looking the better side and looked more likely to add to their tally – another goal and the game would have fizzled out. 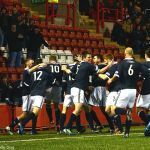 However in the 27th minute the home side got a spark and scored when a ball across the box went to Bain who knocked it sideways for Gavin Griffin. 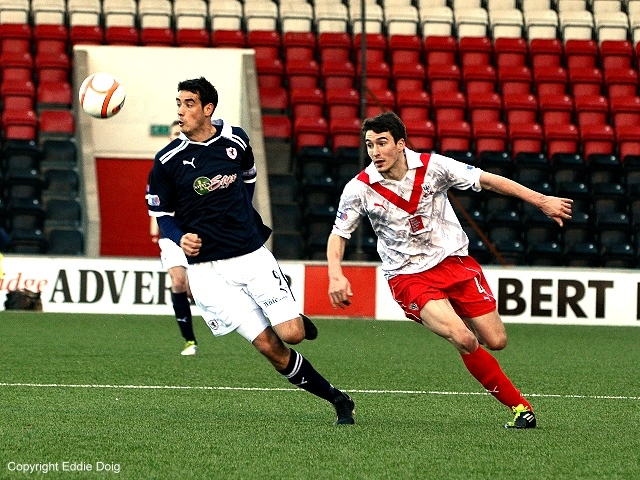 His shot from the edge of the box took a deflection and flew past Laidlaw for an equaliser. In the 32nd minute Clarke found Graham – who again had close attention – he managed to get enough space to shoot on the turn. It was not his best effort, a miss fire… Graham then tried to turn provider squaring the ball to Mensing but his shot was blocked. Di Giacomo headed over then the Rovers support were annoyed when Laidlaw slid to claim the ball at the edge of his box only for him to be unceremoniously bundled out the box by Boyle. 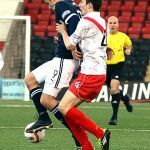 The referee – Stephen Finnie – adjudged that to be a foul for hand ball! Big Ross was not the only person frustrated by that decision and kicked the ball away. 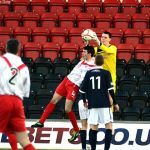 The young keeper was booked for doing so. Spence, who was working hard, took the ball from a throw and forced Arthur to hold his low shot. As the half ended Thomson and Ellis combined to cover a quick throw. Pat Clarke did not come out for the second half with David Smith taking his place on the left. 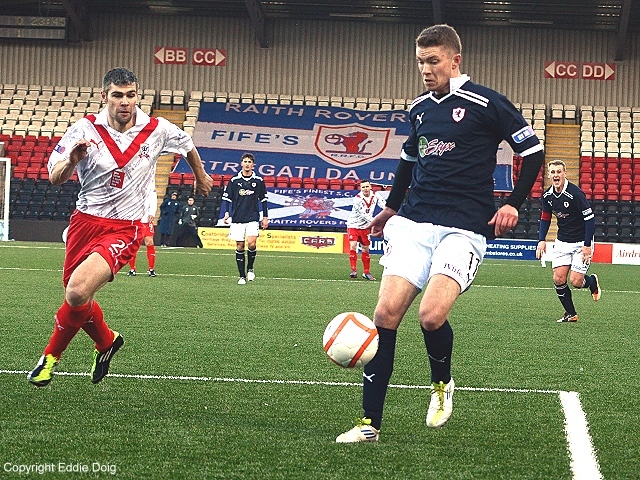 The ball went into the Airdrie box then back out again and the near linesman raised his flag. 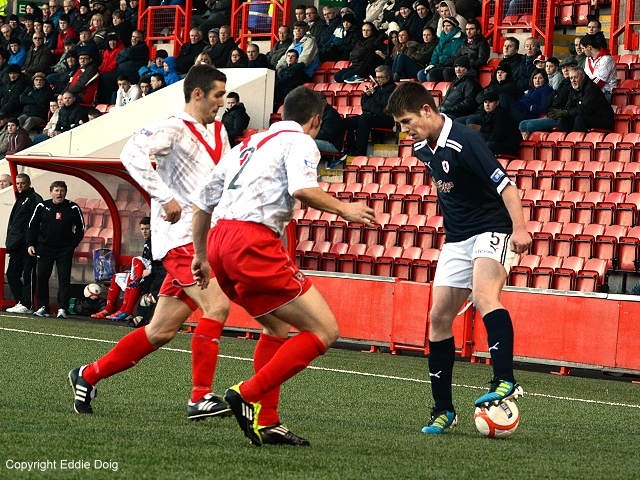 The ball was cleared and whistler Finnie consulted his assistant. 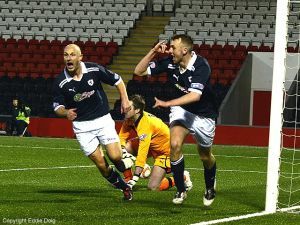 A couple of Airdrie men seemed to be indicating that one had been hit in the face however no-one in the Raith support seemed to know what was going on. 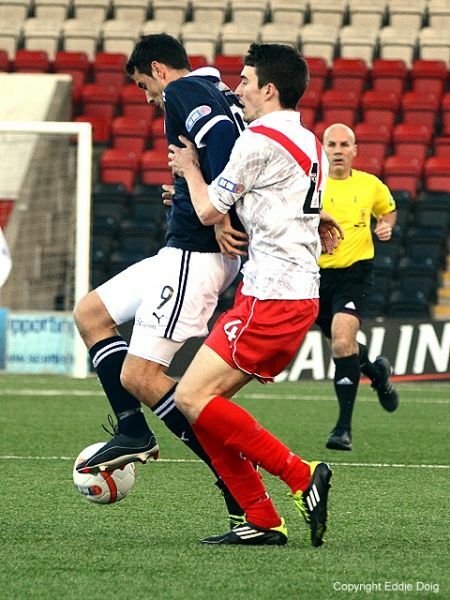 Finnie called over Brian Graham and showed him a red card. Normally such incidents are spotted by some of the fans who express their disappointment with the player, that did not happen and the near linesman was berated at every opportunity for the rest of the game. Only a few minutes later he didn’t help himself giving a throw when the ball clearly hadn’t gone out. Facing 40 plus minutes with only 10 men most would have expected the Rovers to be under pressure. Actually the next opportunity saw Spence getting forward and shot over when a pass to Mensing could have seen Simon get a second. Then from another Rovers break Arthur did very well to touch Spence’s shot wide for another corner. 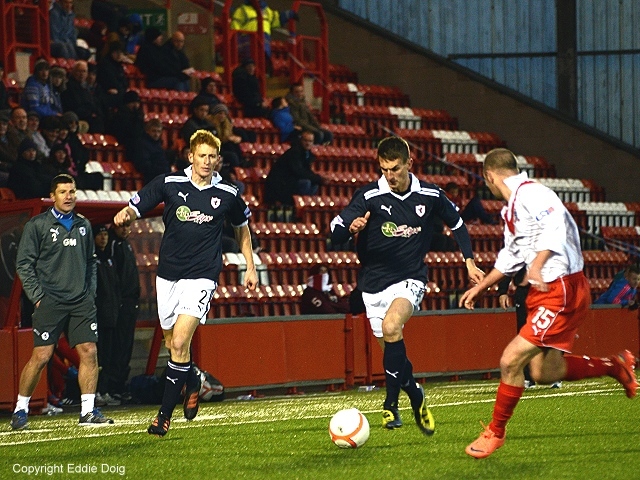 In the 61st minute the Raith support cheered the first free kick they were awarded of the second half. 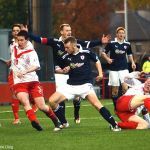 Walker and Spence nearly combined in the home box then home manager Jimmy Boyle was ticked off by the referee after his team won a throw-in. Hill was booked, presumably for persistent fouling while Stallard on a booking and who’d been spoken had been overly vigorous on occasion without being penalised, something he continued. 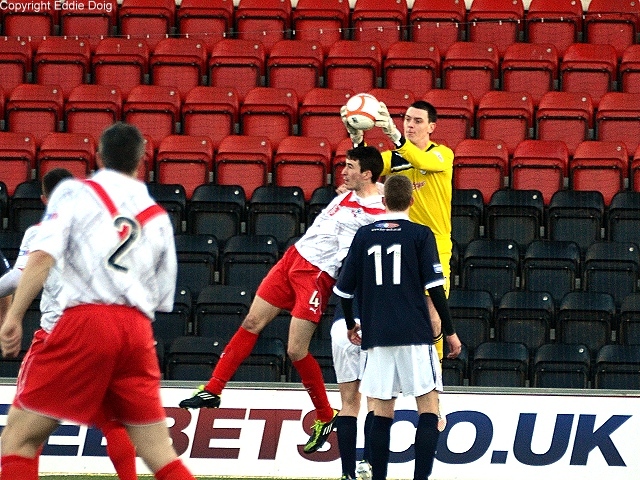 At the midpoint of the half Airdrie hit the post with a header at a corner. Mensing then headed over at the other end. 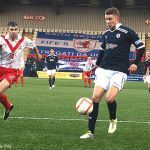 The Rovers continued to look more of a threat and Spence played in Thomson who failed to get his foot around the lay off and the ball went across the box and out for a throw. 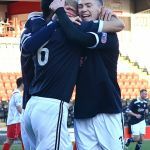 In the 77th minute a teasing cross to the back post found Thomson and a home man and Thomson’s attempt to head away saw him put the ball into his own net. 2:1. 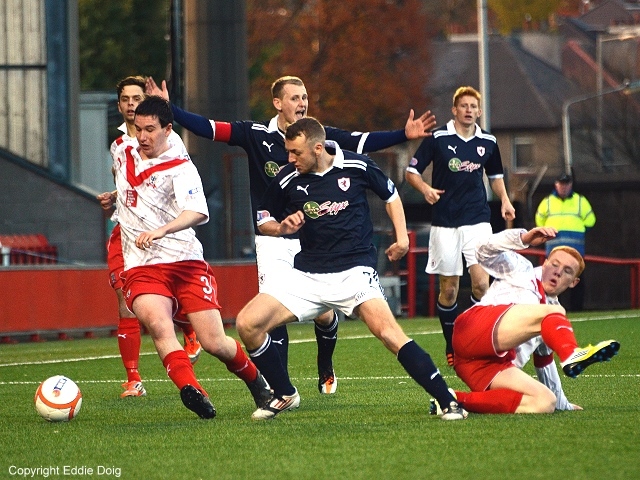 Only a minute later from another Raith corner Ellis’ run across goal saw him head low at goal. Kenny Arthur again did well getting enough of the ball for it to bounce down and be cleared by a relieved teammate. The ‘popular’ Linesman got an offside call very wrong then Stallard shoved Walker aside unpunished. 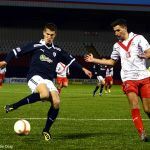 Having seen two Raith men booked for delaying free kicks the visiting support were not that surprised when an Airdrie man was not spoken too or carded for kicking the ball away. Walker couldn’t get a shot in then Smith’s rocket shot from 23 yards went wide. 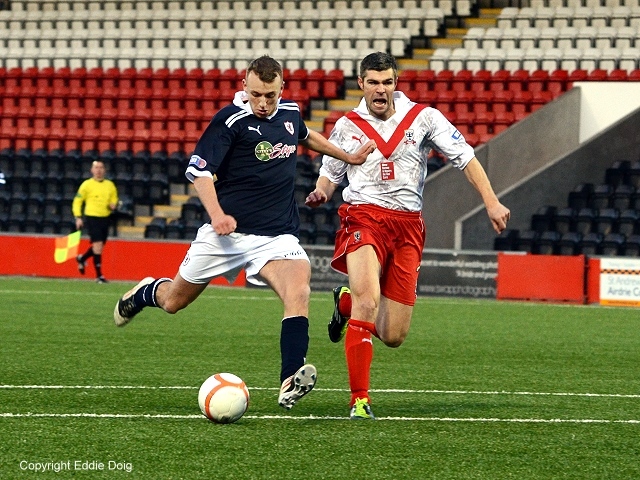 An Airdrie man headed over then Laidlaw was alert pushing a Boyle effort over. The Rovers played some good stuff and despite the one man disadvantage always looked threatening. Many of the Raith support would have had the linesman atop their bonfire but it’s Brian Graham who’ll have got a roasting. Hopefully he will be back on the pitch soon, breaking in his new boots and letting his goals do the talking.